Sundays I decided I don't want to cook ;) I'll do scrambled eggs in the mornings, then we have crackers, cheese, and salmon for lunch and dinner. $11.34 total /3 people eating = $3.78 per person. The green is my artichoke-spinach-parmesan dip. I had it in the fridge leftover from what I brought to my friend Rachel's house... it has a lot of garlic in it, I forget that I should use way less garlic when cooking for others. Not everyone lives with the belief of when in doubt, add more garlic that we have in our home. And while a soaked whole grain cracker would be better, and it would be better if the smoked salmon didn't contain sugar, this is nice compromise meal. 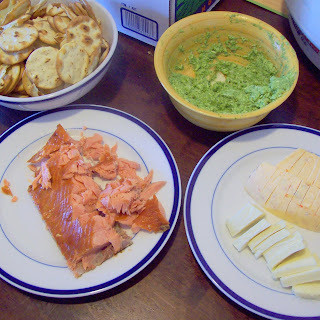 Easy for mom, not too expensive, and the fish and cheese pack a lot of nutrients. Do you have compromise meals at your house? 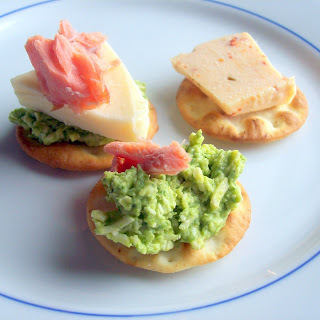 0 Response to "Cheese and Salmon on crackers- Sunday Lunch"